O God, who through the blessed Apostle John have unlocked for us the secrets of your Word, grant, we pray, that we may grasp with proper understanding what he has so marvelously brought to our ears. Through our Lord Jesus Christ, your Son, who lives and reigns with you in the unity of the Holy Spirit, one God, for ever and ever. Today is the third day in the octave of Christmas. The Church celebrates the Feast of St. John, apostle and evangelist. Born in Bethsaida, he was called while mending his nets to follow Jesus. He became the beloved disciple of Jesus. He wrote the fourth Gospel, three Epistles and the Apocalypse. His passages on the pre-existence of the Word, who by His Incarnation became the light of the world and the life of our souls, are among the finest of the New Testament. He is the evangelist of the divinity of Christ and His fraternal love. With James, his brother, and Simon Peter, he was one of the witnesses of the Transfiguration. At the Last Supper, he leans on the Master's breast. At the foot of the cross, Jesus entrusts His Mother to his care. John's pure life kept him very close to Jesus and Mary in years to come. John was exiled to the island of Patmos under Emperor Domitian. 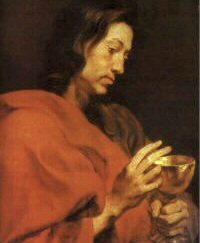 St. John, the Evangelist, who is styled in the Gospel, "the beloved disciple", was a Galilean, son of Zebedee and Salome, and brother to St. James the Greater, both of whom were fishermen. The two were called by Jesus to be disciples as they were mending their nets by the Sea of Galilee. Jesus showed St. John particular instances of kindness and affection above all the rest. He had the happiness to be present with Peter and James at the Transfiguration of Christ, and was permitted to witness His agony in the Garden. He was allowed to rest on Our Savior's bosom at the Last Supper, and to him Jesus confided the care of His holy Mother as He hung dying on the Cross. St. John was the only one of the Apostles who did not forsake the Savior in the hour of His Passion and Death. It seems that St. John remained for a long time in Jerusalem, but that his later years were spent at Ephesus, whence he founded many churches in Asia Minor. St. John wrote his Gospel after the other Evangelists, about sixty-three years after the Ascension of Christ; also three Epistles, and the wonderful and mysterious Book of the Apocalypse or Revelation. He was brought to Rome and, according to tradition, was cast into a caldron of boiling oil by order of Emperor Domitian. Like the Three Children in the fiery furnace of Babylon, he was miraculously preserved unhurt. He was later exiled to the Island of Patmos, where he wrote the Apocalypse, but afterwards returned to Ephesus. In his extreme old age he continued to visit the churches of Asia. St. Jerome relates that when age and weakness grew upon him so that he was no longer able to preach to the people, he would be carried to the assembly of the faithful by his disciples, with great difficulty; and every time said to his flock only these words: "My dear children, love one another." St. John died in peace at Ephesus in the third year of Trajan (as seems to be gathered from Eusebius' history of the Saint); that is, the hundredth of the Christian era, or the sixty-sixth from the crucifixion of Christ, St. John then being about ninety-four years old, according to St. Epiphanus. Patron: Against poison; art dealers; authors; bookbinders; booksellers; burns; compositors; editors; engravers; friendships; lithographers; painters; papermakers; poisoning; printers; publishers; tanners; theologians; typesetters; writers; Asia Minor; Taos, New Mexico; Umbria, Italy; diocese of Cleveland, Ohio; diocese of Milwaukee, Wisconsin. Symbols: Cup or chalice and serpent (cup or sorrow foretold by Jesus); eagle rising out of a cauldron (refers to being a martyr of spirit, but not in deed); serpent entwined on a sword; grave; Prester John seated on tomb, with book, orb, and sword; eagle on a closed book; scroll of his Gospel; scroll of the Apocalypse; nimbed eagle; book.